The fingertip is the part of the terminal phalanx that is distal to the insertion of extensor and flexor tendons. Fingertip injuries are extremely common. A functioning fingertip has sensation without pain, stable padding, and an acceptable appearance. Fingertip injuries occur frequently because hands are used to explore surroundings. 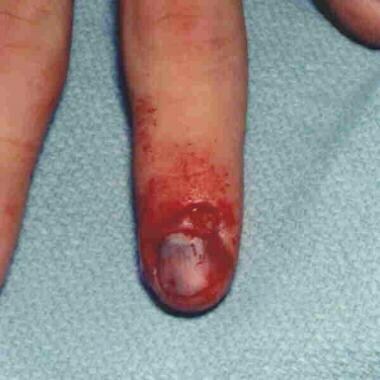 Common types of injuries include blunt or crush injuries to the fingernail creating subungual hematomas, nail root avulsions, and fractures of the terminal phalanx. Sharp or shearing injuries from knives and glass result in lacerations and avulsion types of soft tissue defects. Burns and frostbite commonly involve fingertips. Chang J, Vernadakis AJ, McClellan WT. Fingertip injuries. Clin Occup Environ Med. 2006. 5(2):413-22, ix. [Medline]. Lemmon JA, Janis JE, Rohrich RJ. Soft-tissue injuries of the fingertip: methods of evaluation and treatment. An algorithmic approach. Plast Reconstr Surg. 2008 Sep. 122(3):105e-117e. [Medline]. Mennen U, Wiese A. Fingertip injuries management with semi-occlusive dressing. J Hand Surg [Br]. 1993 Aug. 18(4):416-22. [Medline]. Mühldorfer-Fodor M, Hohendorff B, Vorderwinkler KP, van Schoonhoven J, Prommersberger KJ. [Treatment of fingertip defect injuries with a semiocclusive dressing according to Mennen and Wiese]. Oper Orthop Traumatol. 2013 Feb. 25(1):104-14. [Medline]. Williamson DM, Sherman KP, Shakespeare DT. The use of semipermeable dressings in fingertip injuries. J Hand Surg [Br]. 1987 Feb. 12(1):125-6. [Medline]. Ha NB, Chang AC, Sullivan JS, Leonello DT. Non-operative management of fingertip injuries with an intravenous dressing. J Wound Care. 2015 Jun. 24 (6):276, 278-9. [Medline]. Li J, Guo Z, Zhu Q, Lei W, Han Y, Li M. Fingertip replantation: determinants of survival. Plast Reconstr Surg. 2008 Sep. 122(3):833-9. [Medline]. Zhang X, Shao X, Ren C, Zhang Z, Wen S, Sun J. Reconstruction of thumb pulp defects using a modified kite flap. J Hand Surg Am. 2011 Oct. 36(10):1597-603. [Medline]. Eberlin KR, Busa K, Bae DS, Waters PM, Labow BI, Taghinia AH. Composite grafting for pediatric fingertip injuries. Hand (N Y). 2015 Mar. 10 (1):28-33. [Medline]. Peterson SL, Peterson EL, Wheatley MJ. Management of fingertip amputations. J Hand Surg Am. 2014 Oct. 39 (10):2093-101. [Medline]. Muck AE, Bebarta VS, Borys DJ, Morgan DL. Six years of epinephrine digital injections: absence of significant local or systemic effects. Ann Emerg Med. 2010 Sep. 56(3):270-4. [Medline]. Adani R, Marcoccio I, Tarallo L. Treatment of fingertips amputation using the Hirase technique. Hand Surg. 2003 Dec. 8(2):257-64. [Medline]. Almquist EE. Hand injuries in children. Pediatr Clin North Am. 1986 Dec. 33(6):1511-22. [Medline]. Brown RE. Acute nail bed injuries. Hand Clin. 2002 Nov. 18(4):561-75. [Medline]. Browne EZ. Complications of fingertip injuries. Hand Clin. 1994 Feb. 10(1):125-37. [Medline]. de Alwis W. Fingertip injuries. Emerg Med Australas. 2006 Jun. 18(3):229-37. [Medline]. Evans DM, Bernardis C. A new classification for fingertip injuries. J Hand Surg [Br]. 2000 Feb. 25(1):58-60. [Medline]. Hart RG, Kleinert HE. Fingertip and nail bed injuries. Emerg Med Clin North Am. 1993 Aug. 11(3):755-65. [Medline]. Hirase Y. Salvage of fingertip amputated at nail level: new surgical principles and treatments. Ann Plast Surg. 1997 Feb. 38(2):151-7. [Medline]. Inglefield CJ, D'Arcangelo M, Kolhe PS. Injuries to the nail bed in childhood. J Hand Surg [Br]. 1995 Apr. 20(2):258-61. [Medline]. Ipsen T, Frandsen PA, Barfred T. Conservative treatment of fingertip injuries. Injury. 1987 May. 18(3):203-5. [Medline]. Kim WK, Lim JH, Han SK. Fingertip replantations: clinical evaluation of 135 digits. Plast Reconstr Surg. 1996 Sep. 98(3):470-6. [Medline]. Lee LP, Lau PY, Chan CW. A simple and efficient treatment for fingertip injuries. J Hand Surg [Br]. 1995 Feb. 20(1):63-71. [Medline]. Macgregor DM, Hiscox JA. Fingertip trauma in children from doors. Scott Med J. 1999 Aug. 44(4):114-5. [Medline]. Martin C, Gonzalez del Pino J. Controversies in the treatment of fingertip amputations. Conservative versus surgical reconstruction. Clin Orthop. 1998 Aug. (353):63-73. [Medline]. Muneuchi G, Tamai M, Igawa K, et al. The PNB classification for treatment of fingertip injuries: the boundary between conservative treatment and surgical treatment. Ann Plast Surg. 2005 Jun. 54(6):604-9. [Medline]. Pasapula C, Strick M. The use of chloramphenicol ointment as an adhesive for replacement of the nail plate after simple nail bed repairs. J Hand Surg [Br]. 2004 Dec. 29(6):634-5. [Medline]. Roser SE, Gellman H. Comparison of nail bed repair versus nail trephination for subungual hematomas in children. J Hand Surg [Am]. 1999 Nov. 24(6):1166-70. [Medline]. Russell RC, Casas LA. Management of fingertip injuries. Clin Plast Surg. 1989 Jul. 16(3):405-25. [Medline]. Shabat S, Sagiv P, Stern A, Nyska M. Polyurethane film (opsite) for superficial fingertip avulsion injuries. Plast Reconstr Surg. 2000 Aug. 106(2):512. [Medline]. Stanislas JM, Waldram MA. Keep the nail plate on with Histoacryl. Injury. 1997 Oct. 28(8):507-8. [Medline]. Stevenson TR. Fingertip and nailbed injuries. Orthop Clin North Am. 1992 Jan. 23(1):149-59. [Medline]. van den Berg WB, Vergeer RA, van der Sluis CK, Ten Duis HJ, Werker PM. Comparison of three types of treatment modalities on the outcome of fingertip injuries. J Trauma Acute Care Surg. 2012 Jun. 72(6):1681-7. [Medline]. Venkatramani H, Sabapathy SR. Fingertip replantation: Technical considerations and outcome analysis of 24 consecutive fingertip replantations. Indian J Plast Surg. 2011 May. 44(2):237-45. [Medline]. Weichman KE, Wilson SC, Samra F, Reavey P, Sharma S, Haddock NT. Treatment and outcomes of fingertip injuries at a large metropolitan public hospital. Plast Reconstr Surg. 2013 Jan. 131(1):107-12. [Medline]. Removal of the nail plate with iris scissors. Suturing of a nailbed laceration. U-stitch method of securing the nail plate.